Rep. Mia Love answers a question as she and Salt Lake County Mayor Ben McAdams take part in a debate at the Gail Miller Conference Center at Salt Lake Community College in Sandy as the two battle for Utah's 4th Congressional District on Monday, Oct. 15, 2018. 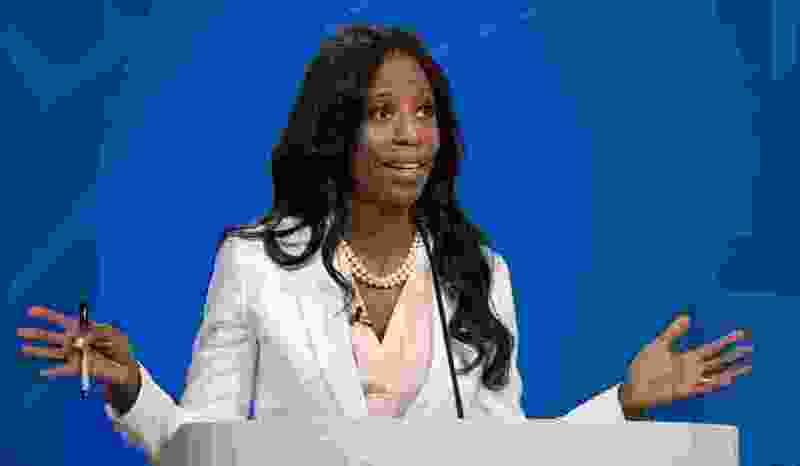 Mia Love claimed during a debate Monday night that the Federal Election Commission decided she violated no laws by raising $1 million for a primary she never faced — and she urged reporters to call the agency to verify that. “The FEC actually said that if you call them, they will corroborate what we have said,” she told reporters. But on Tuesday, the FEC said it had no comment on the situation — neither verifying nor denying Love’s claim that an FEC analyst had called her campaign with that news. Myles Martin, an FEC press officer, said such analysts are not allowed to speak to the press and cannot talk on the record about any FEC positions. He initially said any official position would be put in a letter and posted online, which had not occurred. But another press officer, Judith Ingram, later in the day said in an email that the FEC “does not as a rule memorialize in writing any ‘official position’ on a matter raised in a Request for Additional Information” sent to Love that raised the issue initially. With the agency not verifying Love’s claim, it leaves Democrat Ben McAdams still contending that Love raised and used $1 million illegally in their close race — and Love saying she broke no laws. On Monday just before her debate with McAdams, Love issued a statement condemning him for “peddling lies about me” on the fundraising issue. She said the FEC now told her “that my campaign was legally allowed to raise … and that we may retain” the $1 million raised for the primary before the state GOP convention nominated her and allowed her to skip that later election. 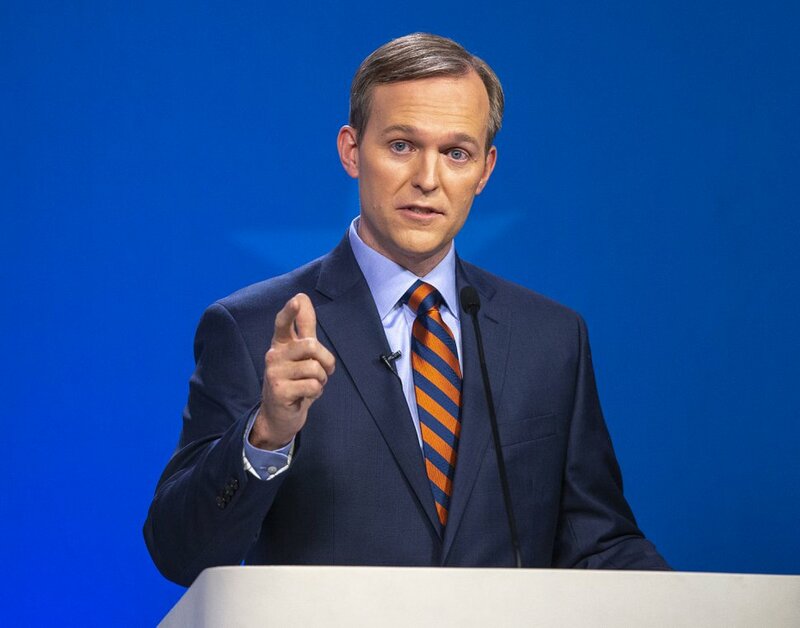 Salt Lake County Mayor Ben McAdams answers a question as he and Rep. Mia Love take part in a debate at the Gail Miller Conference Center at Salt Lake Community College in Sandy as the two battle for Utah's 4th Congressional District on Monday, Oct. 15, 2018. The controversy comes after the FEC wrote the Love campaign in August questioning the legality of $1 million she raised for a primary election she knew she would never face — no GOP challenger ever filed to run against her. “Since the candidate will not participate in the 2018 primary election, any contribution received must be returned to the donors or redesignated to another election” with written permission of donors, the FEC letter also instructed. Love’s campaign then argued it broke no laws and that the FEC previously allowed Sen. Mike Lee, R-Utah, to raise and keep money for a primary that he might face — even though he actually did not. Still, he said the analyst had called to give the campaign a “heads-up” that agency lawyers had determined no laws had been violated, and the campaign could keep money it raised for the primary before the state GOP convention. The campaign had already agreed to refund or redesignate primary election money raised after the convention. 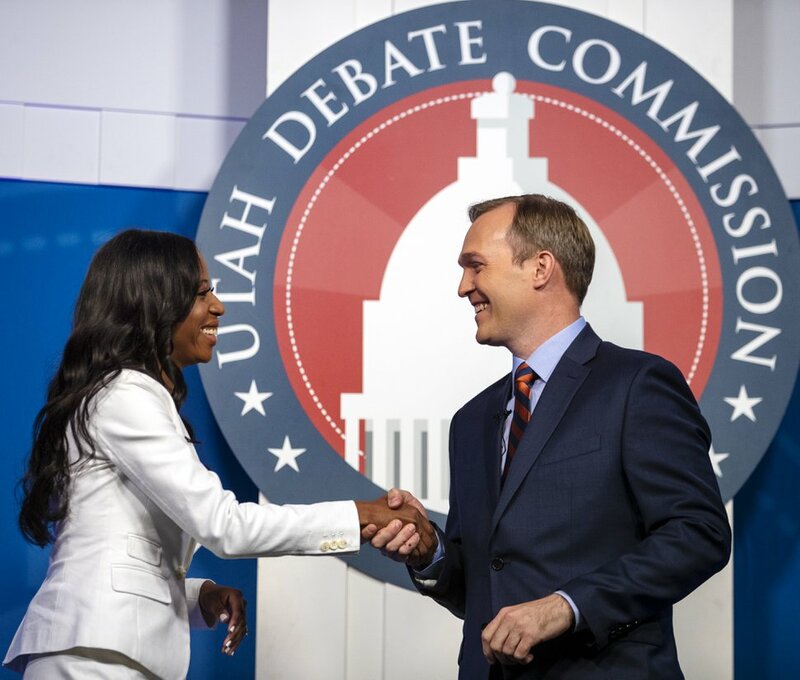 Rep. Mia Love and Salt Lake County Mayor Ben McAdams shake hands as they take part in a debate at the Gail Miller Conference Center at Salt Lake Community College in Sandy as the two battle for Utah's 4th Congressional District on Monday, Oct. 15, 2018. Meanwhile, the left-leaning Alliance for a Better Utah — which had filed a complaint with the FEC over the $1 million raised for the primary — said it had been notified that the FEC still had an open investigation into that matter. Thomas also argued that Love’s campaign should be forced to refund the $370,000 it raised for the primary after the state convention was held because the campaign missed legal deadlines for reallocation. Dave Hansen, Love’s campaign manager, said it has refunded or reallocated all the money raised for the primary — before and after she was nominated at the state convention. “It’s not that we did anything wrong. The money certainly was not raised illegally. It’s a process you go through,” he said. He noted that Utah law allows a potential of three races for federal candidates: a state convention, a primary election and a general election. For each one faced by a candidate, individual donors may give up to $2,700 and political action committees may give $5,000. If donors exceeded limits because they gave for three elections when only two were held, money was refunded, Hansen said. If they gave money designated for the primary, the campaign obtained letters allowing it to be reallocated to the general election, he added. If they gave money with no designation, it has been directed to the general election. Meanwhile, both campaigns filed new quarterly financial disclosure forms late Monday with the FEC. During the three-month period ending Sept. 30, Love raised $1.06 million compared with $866,506 for McAdams. Love has raised $4.3 million during the two-year election cycle (including the disputed $1 million for the primary), compared with $2.5 million by McAdams. In the last quarter, Love also outspent McAdams $1.8 million to $1.4 million. McAdams had more cash on hand on Sept. 30 for the final campaign push — $724,913 to $541,410 for Love. A higher percentage of Love’s money came from PACs, which is not unusual for an incumbent — but McAdams has attacked that as a sign that Love is beholden to special interests. PACs have now given her $947,430 during the cycle, compared with $331,33 for McAdams.